I dropped a stitch when doing the K3tog at the end of the needle and didn’t notice. I dropped the same pattern stitch couple of other times but caught it early enough to tink a few stitches and re-knit. This one must have stayed put a long time before it started to unravel and form the telltale ladder. There was no way to drop a stitch and try to redo it with a crochet hook. At least I didn’t think so. So I crocheted the ladder back up to the K3tog, the stitch that dropped was the middle purl stitch. Being a purl stitch is why it is easy to miss going through since the stitches are tight and it wants to go to the back. Well anyway, I looked through my sewing thread and found a close color. Sometimes close is a cigar. Sewing thread is thinner and relatively strong and makes repairs in this situation almost invisible. I just stitched the loop between the two stitches it was supposed to be between and then used the sewing needle to hide the ends right down the middle of the yarn on each side. If I had used a piece of the same yarn it would have added some thickness to the repair. Sewing thread is hidden within the yarn making it invisible. Just thought I would share this repair technique. Some perfectionists might not think it kosher, but then it is invisible so they don’t need to know about it. 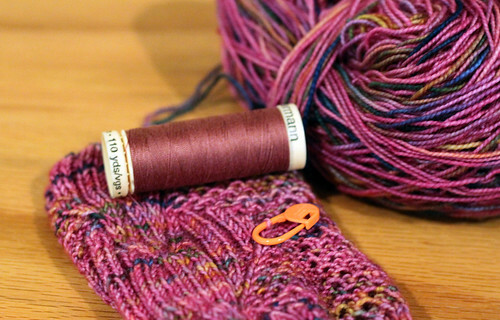 This entry was posted on Wednesday, June 3rd, 2009 at 3:00 am and is filed under Knitting. Tagged: Knitting. You can feed this entry. You can leave a response, or trackback from your own site. Excellent job, that’s my kind of repair! !